In January of this year, Netflix released Joe Berlinger’s “Conversations with a Killer,” a four-episode docuseries that chronicled the exploits of serial killer Ted Bundy. The portrait painted of Bundy showed a man whose charisma and charm helped him to take advantage of his victims and the judicial system. Though it runs over four hours in length, it grabs the audience’s attention and remains gripping until the end. Before finishing his work on the series, Berlinger began working on his first narrative film, also about Ted Bundy. Based on the book “The Phantom Prince: My Life with Ted Bundy” by Bundy’s ex-girlfriend Elizabeth (Liz) Kloeper, “Extremely Wicked, Shockingly Evil, and Vile,” written for the screen by Michael Werwie, takes a different approach to the serial killer chronicle. Only showing one of the crimes in the film’s concluding moments, Berlinger’s movie views Bundy through the eyes of Liz (Lily Collins), showing the psychological effects her relationship with the man and the realization of his true nature caused her while simultaneously showing Ted’s (Zac Efron) captivity and involvement in his own trials. Beginning with the end, Berlinger’s movie opens with Liz visiting Ted in prison. The dimness and grimy aesthetic of the confrontation sets a suitably grim tone for the film. As their final conversation continues, Berlinger intercuts scenes of their initial meeting in a bar where Ted woos Liz and takes her home for the night, easing his way into her and her child’s life. Instead of continuing to cut back to Liz’s jail visit, the movie settles into the past to chronologically tell the story. Liz and Ted settle into a pleasant domestic relationship with the two eventually becoming engaged. While studying law in Utah, Ted is arrested for his suspected involvement in several missing persons cases as well as a homicide. “Extremely Wicked, Shockingly Evil, and Vile” doesn’t delve too deep into the depravity of the crimes, which Ted profusely denies having any involvement in (he proclaimed his innocence before finally confessing right before being executed). Viewers are given the basic details as heard in news reports though more explicit details are revealed in the final trial. As she follows Ted’s media presence throughout his captivity, Liz’s mental state begins to take a sharp decline. While Berlinger has proven himself an excellent documentary filmmaker, his first foray into narrative film does not show the same deft hand. Something seems missing from the final movie. It lacks the grip and drive found in his documentary series. His directing is sloppy. The camera bobs and weaves its way through multiple scenes. Another finds the camera swirling around its subjects, randomly cutting to new angles instead of remaining a fluid shot. Although Berlinger has assembled a cast of strong performers, the actors all seem like a bad fit for their roles. In terms of physical appearance, the casting can be spot on. Namely, Efron who does bear a striking resemblance to Bundy (they are both handsome, charismatic, and likeable). He excellently personifies Bundy in a few scenes – the scene where they read him his indictment in Florida comes across as particularly close to the footage shown in the documentary – but overall his performance feels lacking. He doesn’t ooze charisma the way Bundy did in his multiple interviews. Overall, the actor’s performances don’t work. Lily Collins take on Liz isn’t convincing, coming across more affected than she should in her scenes. 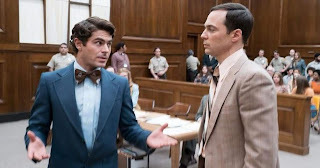 More than a few of the casting choices are odd, most notably choosing Jim Parsons (Sheldon on “The Big Bang Theory”) to portray the prosecutor in Bundy’s final trial. It has become hard to separate Parsons from his TV persona, which seems to come through at times during his performance here, audibly detectable by the laugh his first on-screen appear received from the audience. Faring best among the cast is Kaya Scodelario. Scodelario portrays Bundy’s former girlfriend (ultimately his wife) Carole Anne Boone, who reemerges in Ted’s life during his first trial. Her take on Bundy’s wife, he proposes to and marries her in the middle of the Florida trial, most closely matches the personality of the woman she is portraying. She displays the intensity, and unhealthy obsession, of the woman who held firm to her belief of Bundy’s innocence and stood by his side throughout the trial. By the movie’s conclusion the film pushes Liz more or less into the background, ignoring delving too deeply into her recovery through the help of co-worker (and soon to be fiancé) Jerry (Haley Joel Osment), instead focusing on Bundy’s trial. Berlinger’s narrative feature pales in comparison to his documentary. It serves as interesting additional viewing but if I had to choose one over the other, my choice would definitely not be this movie. “Extremely Wicked, Incredibly Evil, and Vile” will be released on Netflix May 3 giving you plenty of time to binge through “Conversations with a Killer” before deciding whether or not to watch this.